Vello von Fürstenfeld competed multiple times in the D.V. Meisterschaft and passed the Körung 'for life' with Körklasse 1 rating. His litter-brother, Verry von Fürstenfeld, was the winner of the D.V. Meisterschaft in 1970 while his litter-sister, Vilja von Fürstenfeld, became Bundessieger in 1967. “This black male obtained no titles at shows, although he received good reports from various judges. The dog's owner, Mr. Vogel, was more interested at that time in working the dog. Vello passed his Schutzhund III 35 times, came 4th and 6th at the DV working show and also won several working test. He also earned his 'Körung'. He became very important to the breed thought his two sons Bryan von Forell and Bonni von Forell. Bonni: SchH 1 plus winner of numerous show titles and sire of the vom Kloster-Kamp “B” litter (Boschka); vom Eschenhof “C” litter (Centa); von Hagenstern “E, G, J, R” litters (Edda, Elfi, Greif, Gina, Gräfin, Jürgen, Jago); vom Herrnberg “C” litter (Candy, Cindy) and von Frankenland “P” litter (Pero). 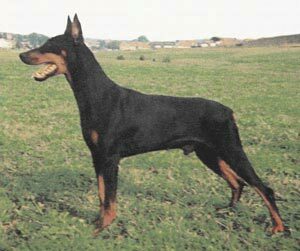 Bryan: Norwegian+Swedish-Champion and sire of the vom Norden Stamm “H” litter (Guys Hilo, Guys Heidi); vom Franckenhorst “D” litter (Don Dayan, Della); Anuschka Bryansdotter; Gravin Grazie; Kasmir-Kandy. Dascha: dam of the von Beelen “J, O” litters (Jago, Jenni). Bulli: SchH 3 and passed the Körung 'for life' with Körklasse 1 rating plus winner of show titles. He is sire of the von der Burg Bäheimstein “A, B” litters (Anja) and vom Hirschertal “J” litter (Jago). Bessi: SchH 3 and passed the Körung 'for life' with Körklasse 1A rating. She is dam of the vom Schonnerhof “A” litter (Assi). Citta: SchH 3, D.V. Leistungssieger in 1973 and passed the Körung. She is dam of the von der Stollburg “I, K” litters (Ilk, Kora). Elke: SchH 3 and passed the Körung 'for life' with Körklasse 1A rating. She is dam of the vom Zenn “B” litter (Bronco, Bessi). Armin: SchH 3, FH 3 plus winner of numerous show titles and sire of the vom Dammberg “K” litter (Kira); von Bayern “C” litter (Coco); vom Hausrucktunnel “C” litter (Cita). Gitta: dam of the von der Brunnenstadt “C” litter (Cora). Bessy: SchH 3 and passed the Körung 'for life' with Körklasse 1 rating. She is dam of the vom Wilden Markgraf “A, B, C, D, F” litters (Bessy, Bina, Conni). Bodo: SchH 1 and sire of the von Jura “G” litter (Gildo). Brando: SchH 2 and sire of the von Jura “B, C” litters (Cilla). Boy: SchH 3, DV-Sieger and passed the Körung 'for life' with Körklasse 1A rating. He is sire of the vom Killmannshof “C” litter (Conny); von der Bärentatze “A” litter (Anja); vom Witten Sand “A, D” litters (Ali) and van de Eland “D” litter (Davina). Boris: sire of the vom Fachsenfeld “A” litter (Anja) and vom Siegelberg “K” litter (Kelli). Butler: sire of the vom Gaxhardter Wald “F” litter (Festa). Bessy: SchH 3 and passed the Körung 'for life' with Körklasse 1 rating. She is dam of the von der Bärentatze “A, B, C, D, F” litters (Bessy, Bina, Conni). Cora: dam of the von Filseck “A” litter (Anuschka, Assi). Cliff: SchH 3 and passed the Körung 'for life' with Körklasse 1A rating. He is sire of the vom Sonnenhof “G, H” litters (Hesta); vom Dammberg “L” litter (Lord) and vom Gaxhardter Wald “G” litter (Gitta). Gisa: passed the Körung and dam of the vom Falltor “F, J, M, P” litters (Festus, Farah, Jana, Mecki, Mona). Stella: dam of the vom Krähberg “C, D, E” litters (Cyra, Dak, Esther). Giselle: passed the ZTP with 1B rating for character and V for conformation plus became a Norwegian Show Champion. She is dam of the Doberhill “A, E, G, M, Q, T” litters (Black Andy, Black Marco).